Halloween is my favorite holiday. My weekly blog for Women & Words was fortuitously scheduled to go live on Halloween, so I did a Halloween blog. I give a little history of Halloween and offer my very own ghost story. A real one. If you’d like to check that out, it’s HERE. One of my favorite things to do is watch classic horror movies. Movies like Dracula, Frankenstein,Forbidden Planet, Creature from the Black Lagoon, Dementia 13, Night of the Living Dead, Halloween, The Exorcist, Psycho, the Hammer movies—such as Dracula: Prince of Darkness and Brides of Dracula and Curse of Frankenstein—and the giant creature movies, such as Them,Kingdom of the Spiders, Day of the Triffids, and Tarantula. I love them all, even when they’re bad. Especially if they’re bad. Which they mostly were. Everyone please support this project! A great author and friend who deserves all the success in the world! 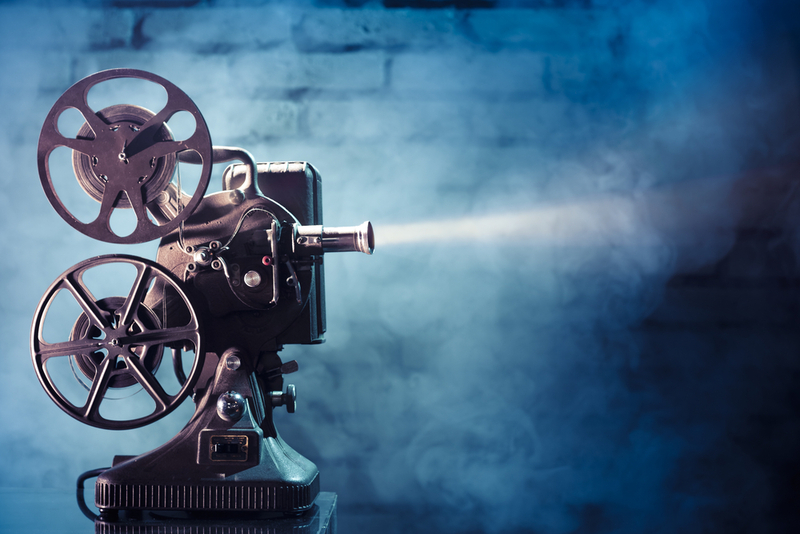 One of my books is going to be used in a MOVIE! Not only THAT but it’s a LESBIAN Movie! Please take a look at this Link as they are an independent and looking for funds to support their endeavors, if you can, please give a little, every $ counts! Not only THAT but I will be running contests to get FREE books as the movie comes closer to production AND when it is finished! So please go help support THIS movie with MY book in it and maybe I will be inviting YOU to come SEE MY book made into a movie SOMEDAY! It is the coolest thing that my blog this week falls on Halloween. Halloween—All Hallow’s Eve, Samhain, Season of the Witch, whatever you want to call it—is my absolute favorite holiday. Vampires, witches, ghosts, goblins, skeletons, scarecrows, mummies, monsters, pumpkins, costumes, jack-o-lanterns, autumn colors, candy, and pie. Can you ask for more from a holiday? Ready yourself for samhain rituals, pirates, vampires, wolf weres, night terrors, tortured souls, haunted houses, and the unexplained. 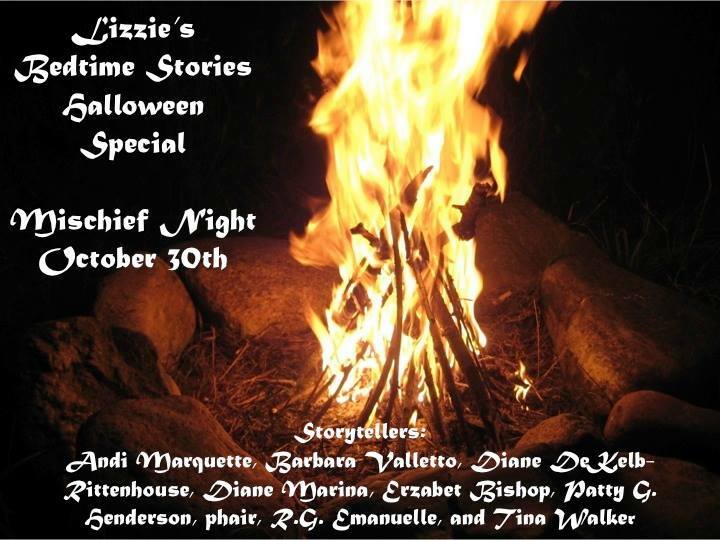 Feel the warmth of the campfire as you listen to these talented storytellers bring Halloween to life with their delightful tales. And if you want to read those amazing stories by Erzabet Bishop, R.G. Emanuelle and Diane Marina you just need to go to amazon, Bella Books or Smashwords to get your personal copy of When the Clock Strikes Thirteen. It’s also available as paperback from amazon now. 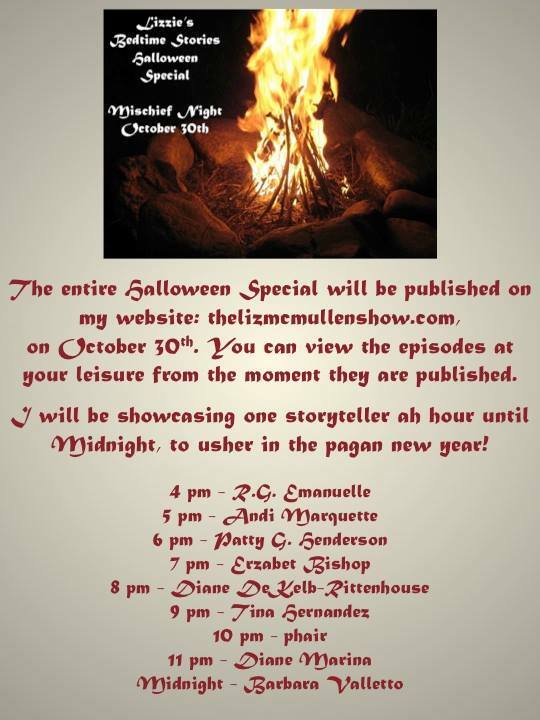 The Liz McMullen Show is a talk show where Liz interviews authors on anything from their body of work to current events. On October 30 she has some special guests for a wonderful show – the Halloween Special. Three of our authors will be reading their stories, currently published in When the Clock Strikes Thirteen: Diane Marina, Erzabet Bishops and R.G. Emanuelle. Tune in on Wednesday and listen to stories that will keep you glued to your seat. And if you want to read them and some more fabulous paranormal stories go to amazon, Bella Books or Smashwords to get your personal copy of When the Clock Strikes Thirteen. Thank you to everyone who participated in Spank or Treat! We had a wonderful team of authors and ambassadors who brought you the fun, and we had a terrific group of commenters. Each time we see more and more faithful VIPs coming back for another round, and we see first-timers excited to discover a new event. We’ll have the ever-popular Love Spanks event in four months, so be sure to spread the word! Also, I’ll be hosting the second annual Advent Calendar again this year. We’ll have daily posts December 1-24, and you’ll get a chance to win free books from your favorite authors! In my Spank or Treat story last weekend, I described Karielle decorating a “pagan altar” otherwise known as a Halloween tree.